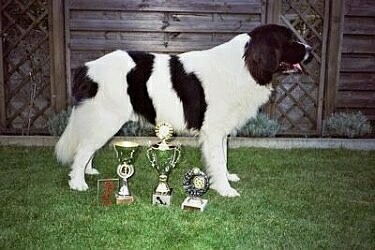 The Landseer should convey the impression of a tall, powerful and well-balanced dog. 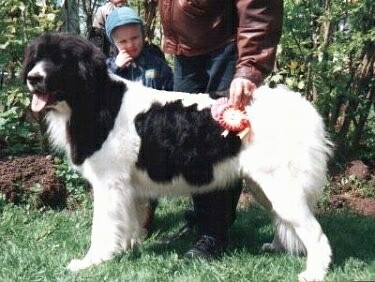 The legs are comparatively longer than those of the black Newfoundland, especially in the male. 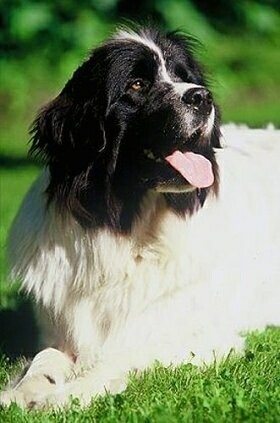 The Landseer is elegant, harmonious, agile and hardy. The wide muzzle is rather short and squared-off. The small, triangular ears are pendant. The small eyes are dark brown; the conjunctiva should not show as it does in the St. Bernard. The nose is black. The feet are webbed for better swimming. Dewclaws should be removed on the hind legs. The tail hangs down. The water-repellent long outer coat is flat, oily and slightly wavy with a thick oily undercoat. Dogs that live indoors, however, tend to lose their undercoats. The top coat, with exception of the head, should be long and as straight and dense as possible, soft to the touch, with good undercoat, which is not as dense as in the black Newfoundland. Slightly wavy coat on back and hindquarters is not objectionable. When brushed the wrong way it falls back into place naturally. The main color of the coat is a clear white with distinct black patches on body and croup. Collar, forechest, belly, legs and tail are white. The head is black with a white muzzle and a white symmetrical blaze. 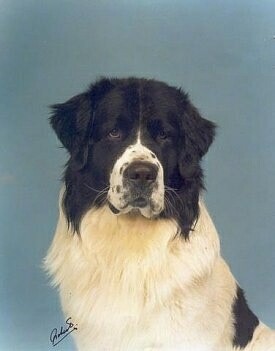 The Landseer is a dog with an outstanding temperament; it is good, courageous, generous and intelligent. It is also a patient dog, mild with guests, and obsequious with its master. He is noble, calm, gentle, loyal and trustworthy with a sweet temperament. Dignified and peaceable. Very devoted. Good and brave. Intelligent enough to act on his own when needed. Protective, but tends to place himself between the intruder and his family rather than bark or growl. Landseers can recognize a dangerous situation and will generally act if the family is threatened. Any dog, other animal, child, or visitor who has no evil intention will receive a friendly welcome. Some males may be aggressive with other males if the owners are not present to properly communicate to the dog that dominance is an unwanted behavior. Patient, playful, and loving with children. Very sociable. Enjoys the outdoors, but also requires companionship. The Landseer drinks a lot of water and may be messy about it, as he loves to get wet. 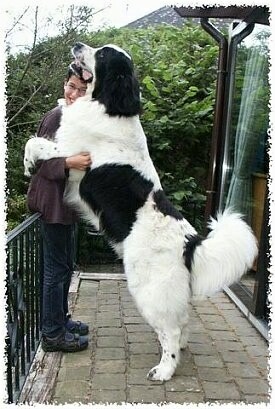 They tend to drool, though not as much as some other giant breeds. 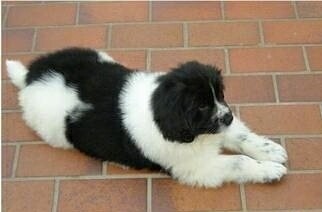 Although puppies require a lot of food, an adult Landseer eats only about as much as a retriever. They love to swim and if backpacking near water, don't let the Landseer carry your sleeping bag—or you may spend a very damp night! This breed may be slightly difficult to train. These dogs are very sensitive to the tone of your voice. Training must be conducted in a calm, but firm, confident, consistent and balanced manner. This dog's huge body tends to move rather slowly. Take this into account during training. Prone to hip dysplasia. Do not let a Landseer get fat. Also prone to a hereditary heart disease called sub-aortic stenosis (SAS). Breeders should have puppy's hearts checked by a veterinary cardiologist at 8-12 weeks of age. Adult Landseers should be cleared of SAS again before breeding. Will do okay in an apartment if sufficiently exercised. They are relatively inactive indoors and a small yard is sufficient. They are sensitive to heat: provide them plenty of shade and cool water in warmer weather. These dogs prefer cool climates. This gentle giant is quite content to laze around the house, but it still needs to be taken on a daily walk. While out on the walk the dog must be made to heel beside or behind the person holding the lead, as in a dog's mind the leader leads the way, and that leader needs to be the human. It will enjoy frequent opportunities to swim and frolic. Daily to weekly brushing of the thick, coarse, double coat with a hard brush is important. The undercoat is shed twice a year, in the spring and fall, and extra care is required at these times. (The heaviest shedding period is in the spring). Avoid bathing unless absolutely necessary, as this strips away the coat's natural oils. Instead, dry shampoo from time to time. 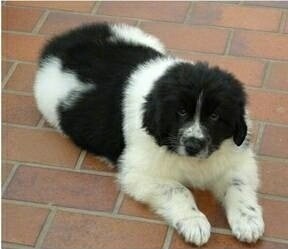 The origin of the Landseer stems back to Germany and Switzerland. 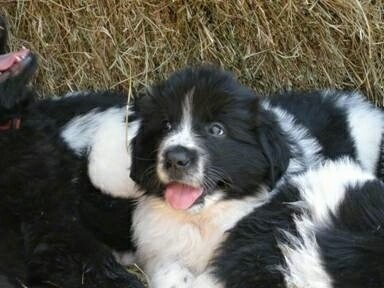 In the USA and Great Britain the Landseer is considered the same breed as the Newfoundland, however in some European countries the Landseer is a totally different breed than the Newfoundland. 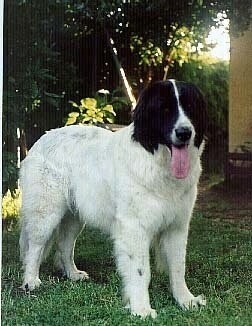 Landseers in Europe have longer legs than Newfies; Landseers are not so massive, they are more sporty dogs. In shows, they compete separately.